On this International Day of the Midwife, UNFPA, the United Nations Population Fund, salutes the contribution of midwives to saving the lives of women, adolescent girls and newborns, sometimes under very difficult circumstances, in hard-to-reach communities, in humanitarian emergencies, and in fragile and conflict-torn countries. Well-trained and supported midwives working in communities are uniquely positioned to provide the compassionate, respectful and culturally sensitive care a woman needs during pregnancy and childbirth. Midwifery is equally important for newborns during the critical first month of life, and is a significant contribution to sexual and reproductive health in general. Midwives are, therefore, essential to achieving the Sustainable Development Goals. In the past 25 years, the world has almost halved maternal deaths, but every year, some 300,000 women still die during pregnancy and childbirth, and almost 3 million babies do not survive their first four weeks of life. A vast majority of these largely preventable deaths take place in developing and crisis-affected countries. If deployed in larger numbers, trained midwives could avert approximately two thirds of these deaths. Significant investments in midwifery are essential if the world is to achieve its ambitious goals of reducing maternal and newborn deaths. UNFPA is helping train and support thousands of midwives in more than 100 countries. A recent survey estimated that in 57 of these countries, UNFPA has trained 66,000 midwives over the past seven years. These critical health-care providers can help more than 11 million women to give birth safely each year, but much more needs to be done. On this International Day of the Midwife, we at UNFPA renew our commitment to working with global partners and countries to strengthen midwifery skills and capacities. We call on countries to acclaim and reward midwives who are working in challenging and hard-to-reach areas, where their services are most needed. We also urge countries to invest in quality training, good working conditions, decent salaries, adequate workforce policies and possibilities for professional growth. Midwives are our heroes and the backbone of sexual and reproductive health. Let us support them and the women and newborns at the heart of their care. President Christian joins fellow International Leaders for Paris Agreement signing ceremony. 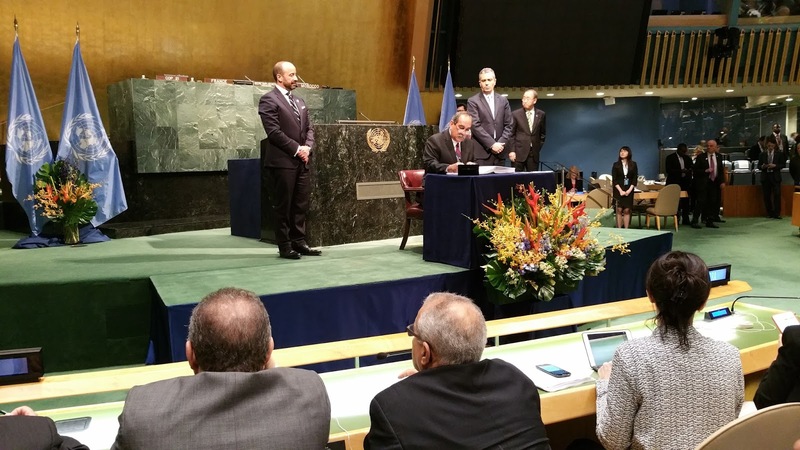 On Friday April 22, 2016, President Peter M. Christian participated in the High-level Signature Ceremony for the Paris Agreement at the United Nations Headquarters in New York City. During the Ceremony, President Christian joined representatives from 174 other countries in signing the Agreement, marking the largest number of countries ever to sign an international instrument in a single day. The Conference of the Parties to the United Nations Framework Convention on Climate Change adopted the Agreement in Paris last December. The Agreement is the first universally applicable international agreement to reduce greenhouse gas emissions. The Agreement commits all of its Parties to keep global temperature rise this century well below 2 degrees Celsius above pre-industrial levels and pursue efforts to limit the temperature increase even further to 1.5 degrees Celsius. The Agreement also provides for enhancing the ability of all countries—particularly developing countries—to deal with the impacts of climate change, including loss and damage. To achieve these goals, the Agreement provides for climate financing, a new technology framework to support research and development in climate technology, a new capacity building framework to enhance the capability of developing countries to take effective climate change action, and a robust transparency framework to ensure that Parties properly and fully account for the actions they take under the Agreement. The Agreement will enter into force after at least 55 Parties representing at least 55 percent of global greenhouse gas emissions ratify the Agreement. After the signing, President Christian delivered a statement that noted the historic milestone achieved by the international community with the adoption of the Agreement in Paris last year, while underscoring that the true test of the success of the Agreement lies in its implementation, particularly at the domestic level. President Christian called on all Parties to the Agreement to continuously update our emission reduction targets in order to "achieve nationally beyond what we talk about internationally." President Christian committed the FSM to take concrete actions in furtherance of its targets, including continuing the FSM's leadership role in advocating for the phase-out of hydrofluorocarbons (HFCs) under the Montreal Protocol. HFCs are greenhouse gases that are several orders of magnitude more potent than carbon dioxide, and whose phase-out will greatly aid in the fight against climate change. President Christian concluded his statement with a plea to the international community to live up to pledges made in connection with the Agreement. Calling for international solidarity, President Christian expressed his hope that ours is "the generation of world leaders that not only talked about climate change, but walked the deck of a sinking ship to find and plug the holes to save our ship." Prior to participating in the High-level Signature Ceremony, President Christian visited the National September 11 Memorial & Museum at the World Trade Center site in downtown Manhattan, where he laid a wreath in remembrance of the victims of the September 11 attacks. President Christian was accompanied to the High-level Signature Ceremony for the Paris Agreement and to the National September 11 Memorial & Museum by First Lady Maurina Christian, Secretary of Foreign Affairs Lorin S. Robert, Secretary of Justice Joses Gallen, Governor of Chuuk State Johnson Elimo, President Christian's Chief of Staff Leo Falcam, Jr., Ambassador Jane J. Chigiyal, and members of the staff of the Permanent Mission of the Federated States of Micronesia to the United Nations. 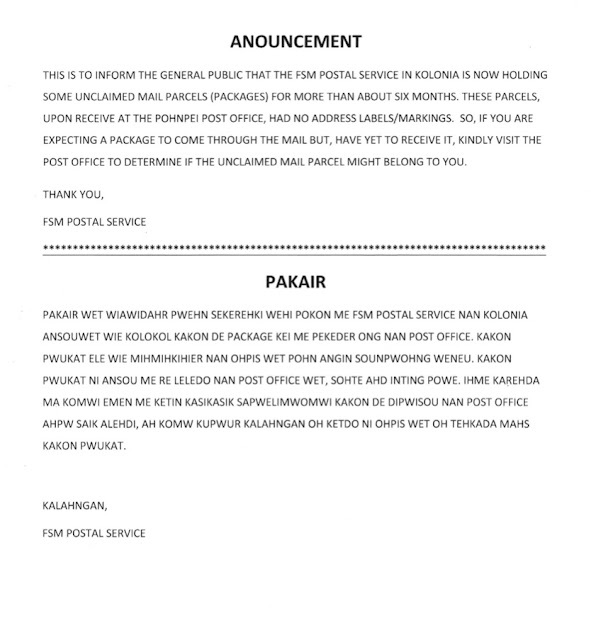 This is to inform the general public that the Federated States of Micronesia (FSM) will be hosting the 47th Pacific Islands Forum (PIF) and related meetings in Pohnpei from September 7-11, 2016. This is an annual Forum for all the leaders of the Pacific Region and it is expected to be attended by Heads of States and Governments across the region with roughly around 500 plus officials and participants. One of the challenges in hosting the Forum as stressed by the organizing Committee is on accommodation or number of hotel rooms and apartments that are available in Pohnpei. As such, the Department of Resources and Development as the focal point of Accommodations Sub-committee has been tasked to coordinate with local and interested individuals, who are willing to rent out their homes during that period. For more information on the Forum and related meetings, please contact Mr. Jackson T. Soram, FSM Forum contact point from the Department of Foreign Affairs at soram@mail.fm, or at Telephone no. (691) 320-2641/2613. On Monday, April 11, 2016, Foreign Minister of Sweden, H.E. Margot Wallstrom arrived in the FSM, Pohnpei State. The purpose of her visit was to discuss issues of mutual interest, including climate change, tourism, capacity building, among others, and to also advocate for Sweden’s candidacy to the United Nations Security Council. During Foreign Minister’s visit, she paid courtesy call on the President, Peter M. Christian, Secretary of Foreign Affairs, Lorin S. Robert, Secretary of Resources & Development, Marion Henry, Secretary of Health & Social Affairs, Magdalena A. Walter and Director of Environment and Emergency Management, Mr. Andrew Yatilman. On Tuesday, April 12, 2016 Foreign Minister Wallstrom also met with the regional and international organizations in Pohnpei and visited the Pohnpei Utilities Corporation Hydro-plant and the Coastal Protection as a Hazard Mitigation Measure in Awak community. She ended her day with a meeting with the Pohnpei Women’s Advisory Council (PWAC). Foreign Minister Wallstrom was accompanied by H.E. Mr. Magnus Robach, Ambassador of Sweden to the FSM, who presented his Letter of Credence to President Christian on Friday, April 8, 2016, and five other delegation members. The delegation departed Pohnpei early morning of Wednesday, April 13, 2016. On April 5, 2016, President Peter M. Christian received Ambassador Paul Maddison of Canada in a Presentation of Credential (POC) ceremony held in his conference room at the Capital in Palikir, Pohnpei. The brief official ceremony accredited the Ambassador as the new Canadian Ambassador to the Federated States of Micronesia based in Canberra, Australia. Attending the ceremony were Vice-President Yosiwo George, Deputy Secretary of Foreign Affairs Samson Pretrick, and other staff from the Office of the President and Department of Foreign Affairs. Following the ceremony, Ambassador Maddison paid a courtesy call on President Christian during which some issues of interests were discussed such as airline service, climate change, fisheries, and scholarship opportunities, to name a few. There was also a discussion with respect to Canada’s bid for a non-permanent seat on the United Nations Security Council in 2020. President Christian thanked the Ambassador for the visit and congratulated him as the new Ambassador of Canada to the FSM. 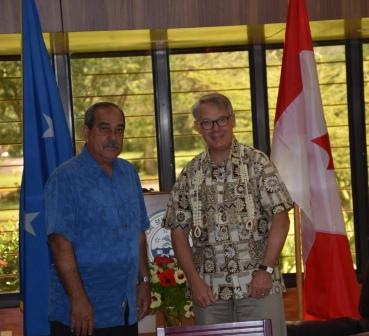 After the courtesy call on President Christian, Ambassador Maddison paid a call on Deputy Secretary Samson Pretrick. He also had meetings with members of civil society as well as some members of the Diplomatic Corps. 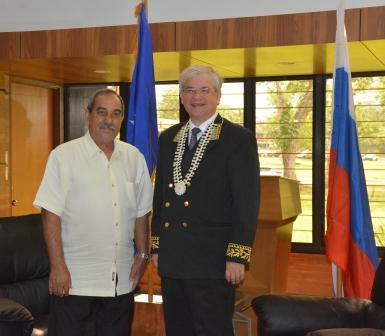 On Thursday April 7, 2016, in a brief ceremony held at the national complex in Palikir, President Peter M. Christian received the Letter of Credence for Ambassador Igor Khovaev, accrediting him as the Ambassador Extraordinary and Plenipotentiary of the Russian Federation to the Federated States of Micronesia (FSM), with residence in Manila, Republic of the Philippines. Following the brief ceremony, Ambassador Khovaev had an opportunity to pay a courtesy call on President Christian during which several issues of mutual interests were discussed, which among others, includes air transportation, climate change, scholarship opportunities and tourism; the latter of which was discussed with special interest considering Russia’s immense portfolio in this sector. Mutual sentiments towards a common desire and aspirations to strengthen and enhanced relations at all levels were highlighted, along with acknowledgement of the ongoing efforts to complete and formalize a mutual visa exemption agreement between the two countries. The visit is the second time for Ambassador Khovaev to visit the Federated States of Micronesia. The first was held last July 2015 when he visited the country on the occasion of President Christian’s inauguration, representing Russia. For this second visit, Ambassador Khovaev undertook a familiarization visit to visit Yap from April 2nd to 6th before his arrival in Pohnpei. After his time in Pohnpei, where he also had opportunity to pay a courtesy call on Speaker Wesley Simina of the FSM Congress, the Ambassador will undertake a similar familiarization visit to Chuuk State from April 9th to 12th. Present in the presentation of credentials ceremony were Secretary Lorin Robert and other members of the President’s cabinet, along with staff from the President’s Office and the Department of Foreign Affairs. Nine governments across Micronesia convened from April 6-7, 2016 at a workshop in Palikir, Federated States of Micronesia to discuss how to work collaboratively to ensure effective enforcement of the Micronesia Regional Shark Sanctuary and discuss the larger fisheries management challenges, including Illegal unreported and unregulated vessels. The Pacific island jurisdictions of Palau, Marshall Islands, Federated States of Micronesia and its four States of Chuuk, Kosrae, Pohnpei, and Yap, the Commonwealth of the Northern Mariana Islands, and the U.S. Territory of Guam attended the workshop hosted by the Government of the Federated States of Micronesia, with support from the Micronesia Conservation Trust and The Pew Charitable Trusts. The Micronesia Regional Shark Sanctuary was completed in 2015, an area that spans 6.5 million square kilometers and prohibits the commercial fishing for sharks, retention of sharks caught as bycatch, and trade, possession, and sale of shark products. Enforcement of the Regional Shark Sanctuary is key to ensuring meaningful protections for these species. The regional workshop builds on a series of enforcement workshops that began in 2012 held across the region to train officials on best practices to implement the shark sanctuary laws. These workshops laid the groundwork for this regional workshop as each jurisdiction now has an understanding of the successes and challenges to enforcing their respective sanctuaries. “The Micronesia Regional Shark Sanctuary is the first in the world and is a significant accomplishment in and of itself, but it also acts as a framework for each jurisdiction moving forward to enforce its regulations,” explained Willy Kostka, Executive Director of the Micronesia Conservation Trust, one of the organizations instrumental in the development of the FSM shark sanctuary. The workshop included facilitated discussions on maximizing the effectiveness of monitoring, control and surveillance (MCS) efforts across the sanctuary and presentations from both government officials and experts in the field. Peter Graham, representing the Pacific Islands Fisheries Forum Agency presented on the multiple tools available to enhance communication and collaboration between governments to enforce fisheries management measures, including shark protections, which will assist these jurisdictions in working together to make regional enforcement a reality. At least 100 million sharks are killed per year in commercial fisheries due to the unsustainable demand for their fins, and nearly 30 percent of all known shark species assessed by scientists are threatened with extinction. “Given the importance of sharks to the Pacific ecologically, economically, and culturally, the ability for these governments to work together to develop solutions to enforce the shark sanctuary on a regional scale is a significant step toward ensuring these species survival,” said Jen Sawada, Officer at The Pew Charitable Trusts.